Historical data navigation: Analyze data across different time periods on the go. Max/Min analysis: Graph variables along with their rolling means, max, min, or sums. Regression Analysis: Apply regression algorithms to create trend lines and insights. 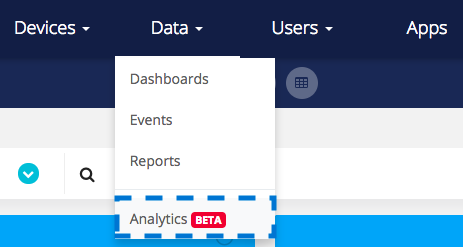 Access the Data Explorer from "Data" –> "Analytics" of your Ubidots Admin account Navbar. 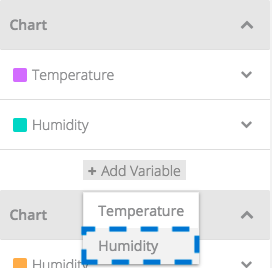 After adding your variables, you'll be able to modify their properties using the vertical configuration menu on the right of the Explorer user interface. 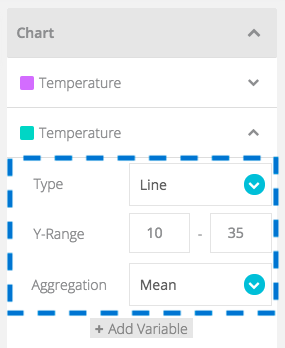 You can set the type, Y-axis range and aggregation method of each variable to be displayed. Data Explorer analyzes data from the chosen Start Date with Span (which is the amount of minutes, hours or days to include after the start date) to generate insights. In additional to select the Start Date and data Span you must select an aggregation method (count, min, max, etc) and a Sample Period (the sample time period of the entire Time Frame selected). 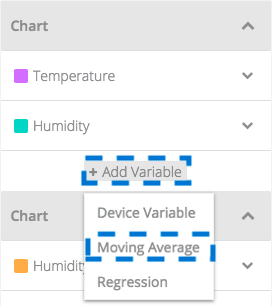 From the right-side of the Data Explorer user interface you are able to add and remove variables for your analysis. Based on the data configuration and time frame, you are able to view real-time charts to analyze, understand, and digest data more easily. A new variable with the Moving Average will be created. 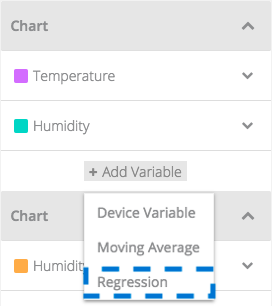 Ubidots computes the regression trend using the dots (data points) currently being displayed in the Data Explorer Chart. 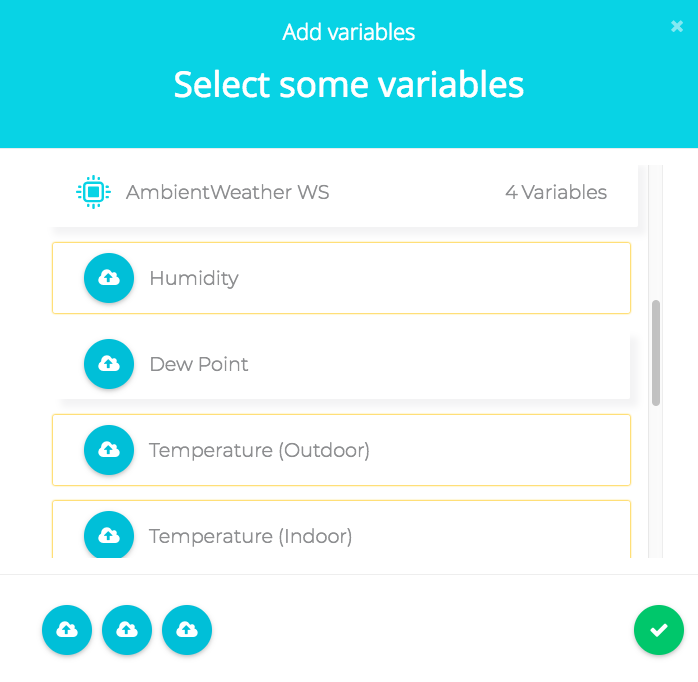 Ubidots does not compute the regression using the entirety of the variable's time frame. Ubidots doesn't use milliseconds as the time unit to compute the regression, as it would yield very large-magnitude coefficients. For this reason, the sample period is used. We see the evolution of Statistical and Machine Learning methods as an opportunity for IoT entrepreneurs to enhance their solutions and add more value to their customers. 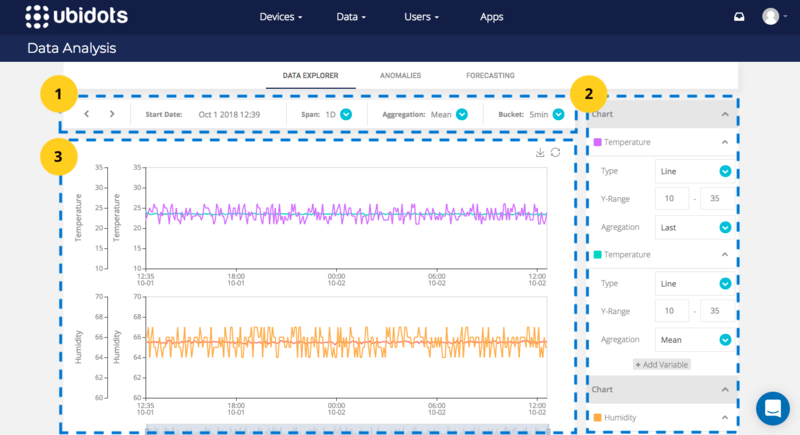 As a next step towards enriching our Analytics Data Explorer module, Ubidots is working on an machine learning mechanism for anomaly detection. How would you like to apply Machine Learning to IoT? Feel free to drop us your comments and suggestions using our in-app chat from the Data Explorer user interface.